Ready to Ship Monitor Stands that Support Brackets for 60" LED TV Manufacturers are Rugged Mobile Displays! These Monitor Stands are In Stock Now! Buy Wholesale! Heavy Duty TV Stands vertically mount televisions that are 37"-60" in size & 176 lbs. in weight! Lockable wheels on base make transport of display a simple task. Durable construction of heavy duty TV stands ideal for trade show and convention use. Vertically mount VESA compatible: 200mm x 200mm, 400mm x 200mm, 400mm x 300mm, 400mm x 400mm, 600mm x 400mm, 800mm x 200mm, 800mm x 400mm, & 1200mm x 400mm. Spartan TOUGH displays are the highest quality stands we offer, made of steel with a black powder coat finish. The plasma mounts, heavy duty monitor stands are height adjustable to allow users to place the monitor at just the right height for maximum viewing ability. 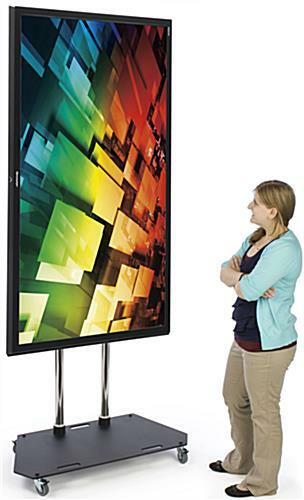 These LCD television stands hold a television that weighs up to 176 lbs. The television stand has a tilt bracket to angle the monitor to provide the best view, just like wall mounts for living room use. The displays ship unassembled and include instructions and assembly tools. The classic plasma display is VESA compatible for 200mm x 200mm through 1200mm x 400mm. That ensures this monitor stand will support many brands of televisions including Panasonic and NEC. These heavy duty monitor stands that support 60" TVs are designed for vertical mounting and have extremely long arms to support larger monitors. The LCD television stands are designed to hold flat panel screens only in portrait (vertical) mode, as the arms will be visible if a monitor is in landscape (horizontal) orientation. The classic plasma displays, heavy duty monitor stands with wheels move easily within a room. 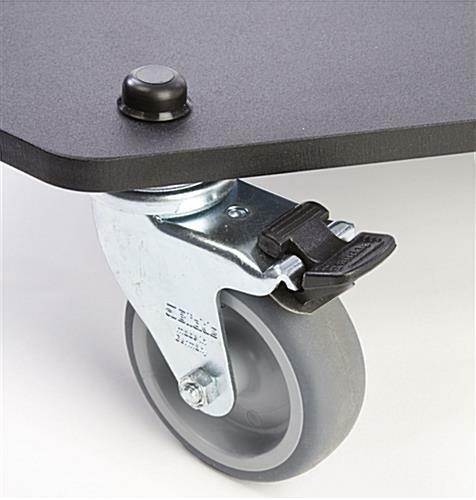 The lockable wheels stabilize the stand once in a desired position. 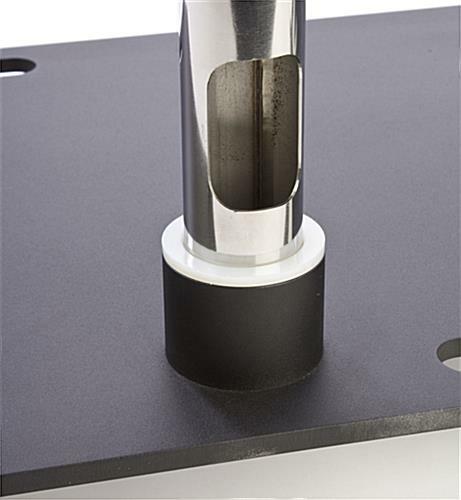 Heavy duty monitor stands that are durable feature a steel construction. These displays are ideally used in high traffic areas and the durable constructions ensures years of use. The heavy duty monitor stands for trade shows are also found at convention centers and in business lobbies! Vertically mounting a monitor provides a different look that will attract extra attention to your presentation. These quality monitor stands for 60" television mounts are the last television stands you will ever need! 23.6" x 49.0" x 1.0"